I learned this song from the Watersons’ 1981 LP Green Fields and for pretty much all of the intervening 35 years it has been one of my default songs to fall back on, when I need a chorus song in a singaround or pub session. noted by Frank Kidson from Mrs Kate Thompson of Knaresborough. The Full English, of course, has the tune which Frank Kidson collected from Mrs Thompson in Knaresborough; while the words (with a slightly different tune), which were noted down by Alfred Atkinson from an unnamed singer in the Isle of Axholme – in North Lincolnshire, between Doncaster and Scunthorpe – in 1904, can be found in the 1905 Journal of the Folk-Song Society. 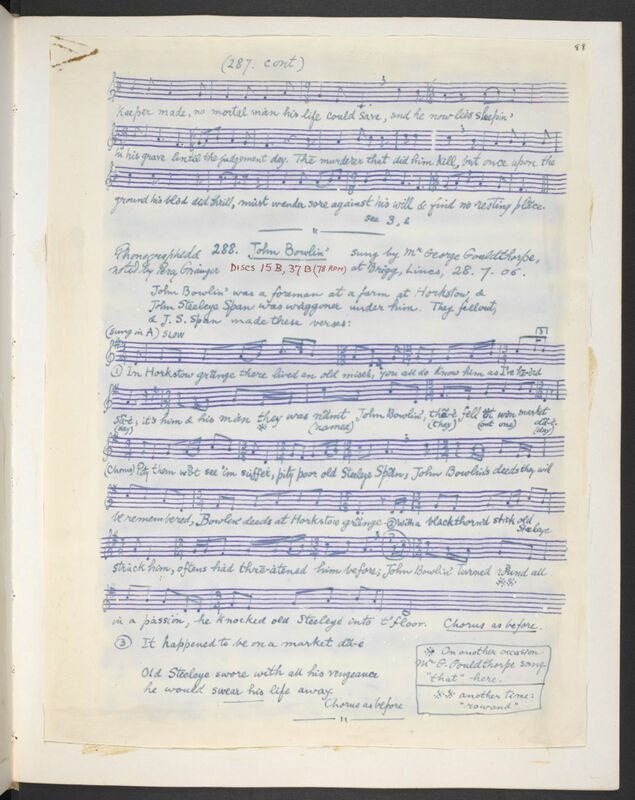 Other versions have been collected in Lincolnshire (by Percy Grainger), Gloucestershire (Alfred Williams and Cecil Sharp), Somerset (Sharp), and Herefordshire (Ella Leather). I learned the song to sing with Caroline Jackson-Houlston, and it was she who typed out the words for me, almost certainly from the JFSS. 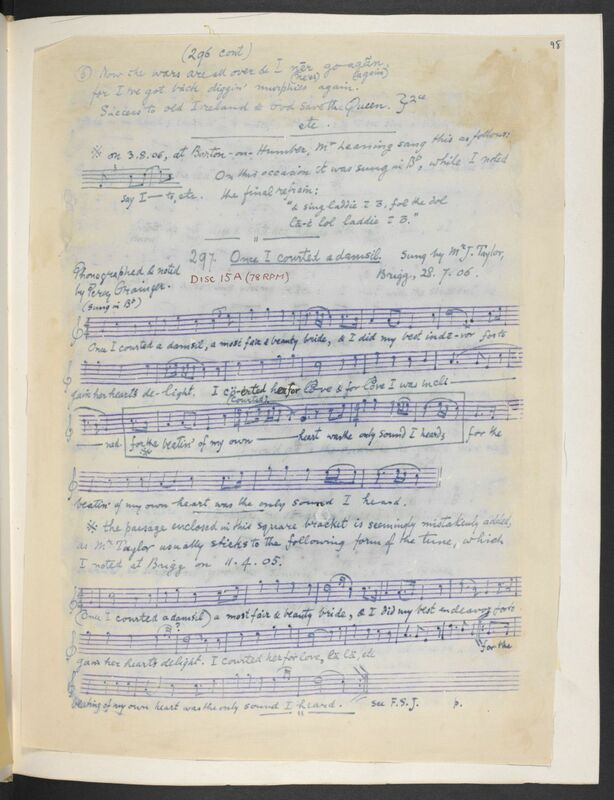 Whereas the Watersons (following the collected version) have the last line of the chorus as “For my young banker I will go there”, Caroline changed this to “For my young banker I will go bare”. This seemed to make more sense in context and, she thought, was almost certainly how the line had originally been written. But in fact the broadside version (titled ‘A new song called The banking boy’) which you can see on the Bodleian’s Broadside site, also has that line as “For the young banker I will go there”. A new song called The banking boy – 19th century ballad sheet from Broadside Ballads Online. The young banker in this song, incidentally, is not a high-flying, cocaine-snorting, economy-destroying financial whizzkid, but “a man who made embankments, stone walls and such” (A.L.Lloyd), or perhaps “A labourer who makes or repairs the banks of waterways; spec. one who digs drains, ditches, or canals” (OED). 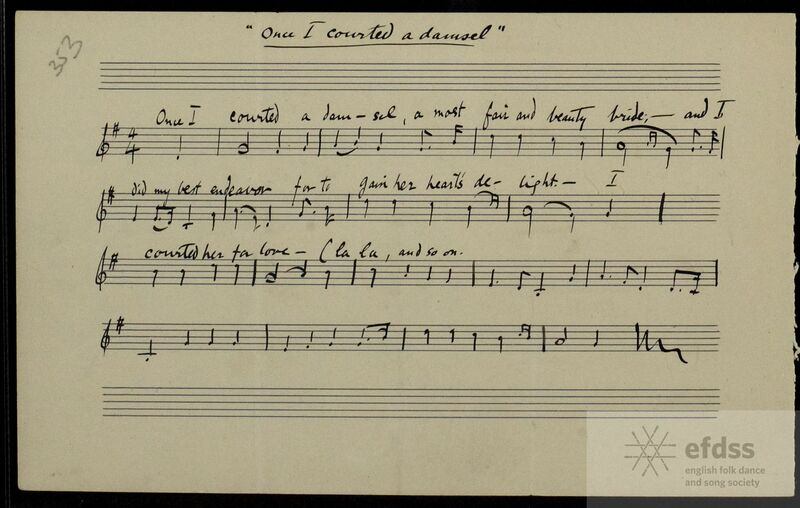 Percy Grainger recorded the melody for I Courted a Damsel from the great Joseph Taylor, and the words are from various sources. I learned it from Bill Prince, who had it from a woman he calls a songfinder extraordinary, whose name is Michelle Soinne. Now I’m pretty sure I own a copy of that LP – bought at Sidmouth in the early-mid nineties, when festival record stalls were selling off their stocks of vinyl at knock-down prices. Bizarrely, I can’t recall ever having listened to the record though (an omission I mean to rectify as soon as possible). And – although I knew that Martin had learned this song from Bill, who in turn had learned it from Michelle – I hadn’t realised that he had ever recorded the song. I first heard it performed by my friends Michelle Soinne and Andy Cheyne, both at live gigs and on their excellent cassette-only album Fish Royal. It appears that Percy Grainger – with Frank Kidson, whose transcription is shown below – first noted the song from Joseph Taylor in April 1905. He returned to make a phonograph recording of the song in July the next year. As far as I know, that recording has never been made publicly available – it’s not on Unto Brigg Fair nor on any of the volumes of The Voice of the People. Maybe the surviving copies of the recording are simply no longer playable. I learned the words from Yellowbelly Ballads Part Two edited by the poet Patrick O’Shaughnessy. O’Shaughnessy had previously included Joseph Taylor’s fragment, with additional verses composed by himself, in Twenty-One Lincolnshire Folk Songs, but had subsequently realised to which family of songs the fragment belonged, and in Yellowbelly Ballads the additional words are adapted from the version collected by Henry Hammond in the Alms Houses at Taunton, from a Mr Poole. The beauty bright – broadside printed for W. Armstrong, Banastre-street, Liverpool, between 1820 and 1824. From the Bodleian collection. A bit of a classic this: really good story line (young man puts love before riches, is falsely accused, and faces a sticky end) and a fine modal tune. What’s not to like? I had the tune from Joseph Leaning, via a 1908 cylinder recording made by Percy Grainger at Brigg in Lincolnshire, via the iconic 1970s Leader LP, Unto Brigg Fair. It is not unusual for songs from the oral tradition to have incomplete or confused sets of words, and to then resort to printed sources to fill in the gaps. But the exact opposite was true in this case – Mr Leaning’s version seemed to me to be just too wordy (maybe he learned the song from a printed broadside, which have a tendency to be prolix). So I’ve used a more concise set of words from Peggy Seeger and Ewan MacColl’s Singing Island. Those words are credited to William Miller of Stirling, who I think I’m right in saying was Ewan MacColl’s Dad. Sheffield ‘prentice – broadside ballad printed by Harkness of Preston, from the Bodleian collection. An earlier recording of me singing this song can be found on my 1990 cassette Love, Death and the Cossack. Musicians will, I think, congratulate Mr. Lolley upon obtaining such a fine and sterling old air. I wish I could say as much for the words. It can’t have been too long after hearing The Watersons that I came across the recording by Martin Carthy and Dave Swarbrick on their album But Two Came By. Martin’s version is that sung by Joseph Taylor, which I first heard in my student days. Finding the classic Leader LP Unto Brigg Fair in Blackwell’s Music Shop in Oxford, I immediately coughed up the £4.50, or whatever records cost back in those days. Whatever it cost, it was money well spent. These days, you can find a recording of Joseph Taylor singing the song on The Voice of the People Volume 18. And purchase a Flipiday Flobbody hat. The White Hare, broadside ballad from the Bodleian Collection. I learned this from the wonderful Joseph Taylor of Saxby All Saints, Lincolnshire, via the LP Unto Brigg Fair. Percy Grainger’s 1908 recording can be heard these days on The Voice of the People Vol. 3, O’er His Grave the Grass Grew Green. The song is, as it were, of no fixed abode. Set here in Worcester City, the version which has been a staple of Magpie Lane’s repertoire for the last twenty years has the action taking place in Oxford City, It is also known as ‘Jealousy’ and (spoiler alert) ‘Poison in a glass of wine’. I first heard this sung by Martin Carthy on the LP But Two Came By. It’s a fine version, but I’m sure Martin would be the first to agree that the definitive recording of the song is that made of a seventy five year old Lincolnshire farm bailiff in 1908. That singer of course was Joseph Taylor of Saxby All Saints, from whom the Australian composer Percy Grainger recorded a number of fine, beautifully-sung pieces on an Edison cylinder machine – although in this case the recording was made at a specially-arranged London session for the Gramophone Company. Grainger’s recordings were made available in the 1970s on Unto Brigg Fair, a lavishly-produced Leader LP. 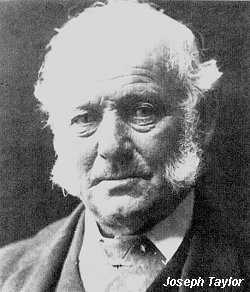 Long unavailable of course, but several recordings of Joseph Taylor were included on Topic’s Voice of the People series. ‘Creeping Jane’ can be found on Volume 8 A Story I’m Just About to Tell, and if you’ve never heard Joseph Taylor’s singing, I really can’t recommend it too highly.